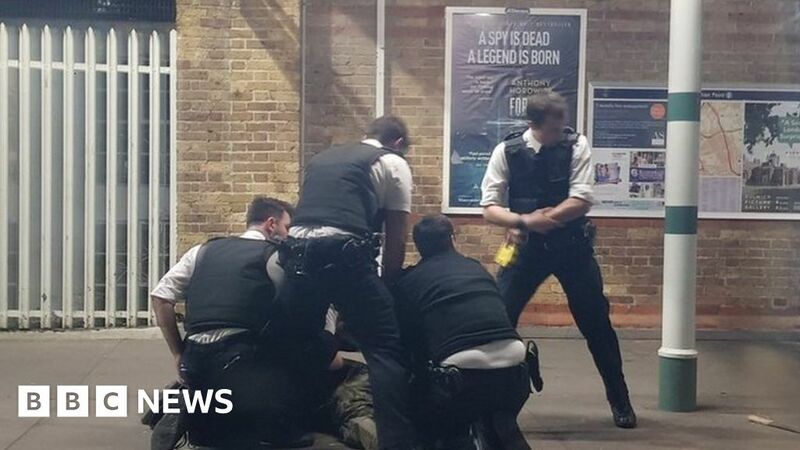 A machete-wielding man was Tasered on a railway station platform as “terrified” rush hour commuters looked on. Police pinned the man – filmed waving a “massive” blade at Tulse Hill station in South London – to the ground shortly after 18:30 GMT on Monday. Witnesses described “chaos” as he chased people with the weapon. A 59-year-old man was arrested on suspicion of attempted murder and possessing an offensive weapon, police said. BTP said there were no reported injuries and the incident was not believed to be terror-related. The arrest comes on the day Sadiq Khan announced Lambeth Council leader Lib Peck as the director of his new Violence Reduction Unit.